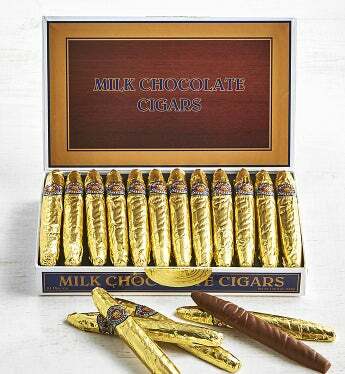 Help a favorite guy celebrate life's special moments, stock the man cave, or just feed his chocolate cravings by sending him this classic cigar box filled with gold foil wrapped milk chocolate cigars. He'll love the decadence of the premium milk chocolate and the authentic cigar bands! Holds two dozen ""cigars"". Also makes a great business gift! A perfect way to recognize the company's top performers! Great for dad or grandpa too! Or even for a bachelor party! Help a favorite guy celebrate life's special moments, stock the man cave, or just feed his chocolate cravings by sending him this classic cigar box filled with gold foil wrapped milk chocolate cigars. He'll love the decadence of the premium milk chocolate and the authentic cigar bands! Holds two dozen "cigars". Also makes a great business gift!